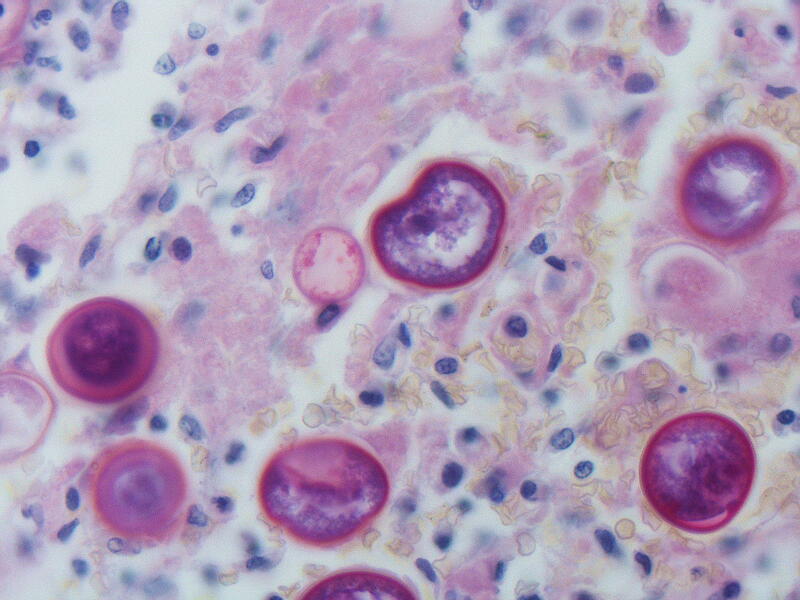 A stain of coccidioidomycosis, an infection caused by the fungus coccidioides. A San Antonio researcher has gotten a nearly $2 million grant to come up with a vaccine against the fungus that causes valley fever. Valley Fever is usually a respiratory ailment, and can also cause flu-like symptoms, said Texas Department of State Health Services spokesman Chris Van Deusen. The fungus that causes valley fever, coccidioides, lives in the dirt in the Southwest, including southwest Texas, Arizona and California. When the wind kicks it up, spores from the dirt can settle in the lungs when inhaled and start to grow. In rare cases, this condition can become the life-threatening disseminated coccidioidomycosis, which is when the infection spreads beyond the lungs to other parts of the body, including the skin, bones, liver, brain, heart, and the membranes that protect the brain and spinal cord. The infection can then lead to complications, including meningitis. University of Texas San Antonio biology professor Chiung-Yu Hung, a member of the South Texas Center for Emerging Infectious Diseases, is one of many researchers specializing in the study of vaccine development, biodefense, immunology and molecular microbiology. The Department of Health and Human Services has given Hung and her team nearly $2 million to study coccidioides, and find a way to prevent infection in humans. "First of all we have to understand how our bodies fight off this pathogen,” she said. “Then we can harness this knowledge to make a vaccine." If Hung succeeds, it would be the first-ever vaccine available for any type of fungal infection. She expects it to take five years to get preliminary results on a possible vaccine. She said it’ll be roughly 10 years before a vaccine might be produced for the public.